Sherwin Williams is the largest producer of paints and coatings in the United States. General Polymers is a subsidiary of Sherwin Williams manufacturing over 300 industrial coating and chemical containment products. Tennant Company is the leading manufacturer of sweepers and scrubbers, Tennant is also a manufacturer of industrial coatings with a diverse line of odorless urethanes. Sika is a manufacturer of construction products and the United States third largest manufacturer of industrial coatings including ICS Garland and Valspar Coatings. Florock is a well-respected concrete floor paint research and development company located in Chicago, Il. Polymerica has become one of the World’s leading manufacturers of epoxies, industrial coating systems and design polymers used in industrial, commercial and institutional environment. Key Resin Company offers the industry experience and product quality to meet the demands of your specific polymer flooring and coating needs. Eastern Resins has been in the business of formulating epoxy resin systems for industry since 1960. In the 70's Eastern became a leading supplier of decorative epoxy coatings for the jewelry and related industries. In 1996 Eastern's product line again expanded to include a complete line of epoxy flooring systems for the construction industry. KCC Corrosion Control is a primary source of advanced polymer technology for controlling corrosion. Pittsburgh Paints is a subsidiary of PPG in addition to one of the oldest manufacturers of paint they have a line of concrete and masonry coatings. O'Leary Paint manufactures and distributes architectural, commercial, and industrial paints, coatings and related equipment and supplies specifically formulated to provide optimum performance for our rugged Midwest climate. Euclid Chemical Company serves the global building market as an ISO 9001:2000 supplier of specialty products and support services for the concrete and masonry construction industry. L&M Construction Chemicals is a manufacturer of concrete sealers, densifiers, stains and concrete treatments including the FGS Permashine system. ARDEX develops, manufactures and markets specialist construction materials for substrate preparation, leveling floors. Brickform is a manufacturer of concrete and masonry stains sealers dyes and texturing systems . H & C, established in 1929, manufactures a line of concrete stains sealers and garage floor coatings. Tnemec manufactures industrial coatings and concrete treatments specializing in chemical containment and wastewater treatment applications. Carboline Company is a world leading supplier of corrosion resistant products specializing in high performance coatings, linings, and fireproofing. Chips Unlimited is an Arizona based manufacturer of Color Chips for Seamless Flooring Systems. 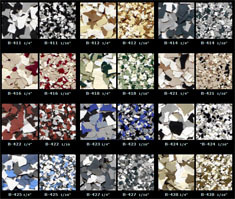 Estes' Company, since 1968, has produced high-quality, colored granules for architectural use, especially resin-bonded seamless flooring. 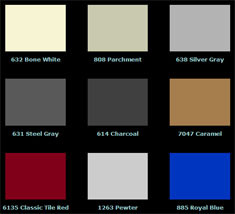 They also manufacture a line of color chips for seamless resinous flooring. P.B. Gast & Sons is a West Michigan based supplier and distributer of industrial and commercial cleaning chemical supplies and equipment. Tennant Company is a Minnesota based manufacturer with a 300,000 sq manufacturing facility in Holland, MI that produces industrial and commercial cleaning chemical equipment and chemicals. The Advance brand is part of the Nilfisk-Advance Group, owned by NKT Holding in Denmark. Nilfisk-Advance is among the world’s leading suppliers of professional commercial and industrial floor cleaning equipment. Factory Cat brand products are built by the R.P.S. Corporation incorporated in Wisconsin in 1986. Factory Cat manufactures battery floor scrubbers, battery floor sweepers and battery sweeper / scrubber combination floor machines for the industrial sector. Viper North America is a manufacturer of floor maintenance equipment. BW Manufacturer is a Grand Rapids Michigan Based manufacturer of surface preparation equipment including shot blasters scarification and diamond grinding equipment as well as dust recovery vacuums. Ruwac, since 1985, has been manufacturing portable, central and specialty industrial vacuum systems ranging from 2 to 250 horse power. The Blastrac brand offers environmentally-friendly portable surface preparation equipment for concrete, steel, stone, asphalt and other surfaces. Their product line includes shot blasting systems, grinding and concrete polishing and grinding systems tile removal equipment and dust collection systems. Substrate Technology is a provider of concrete surface preparation and concrete, marble & terrazzo polishing products. HTC produces and sells patented professional grinding and janitorial systems which comprises both tools and machines for preparation, concrete, granite, natural stone and wood. Innovatech Products and Equipment Company supplies surface preparation equipment and tooling including concrete polishing and Shotblast equipment and supplies. Global Polishing is Sherwin Williams manufacturer and supplier of diamond grinding and polishing equipment as well as chemical sand supplies for staining and densifiying concrete. EDCO offers a complete line of easy-to-use surface-preparation equipment . EDCO products to grind, scarify, remove surface materials, scrub, clean, saw, finish and prepare concrete for overlays, waterproofing membranes, joint sealing, and terrazzo and epoxy installations. Kut-Rite manufactures equipment for the surface preparation, polished concrete and removal industries.